Did North Korea really just conduct a hydrogen bomb test? Despite Kim Jong Un’s boastful declaration that it detonated a hydrogen bomb, there now seem to be some doubts. The fact that the explosion might be just have been a plain old-fashioned atom bomb is of little comfort to this former child who grew up with a bad case of nuclear jitters. The idea of an unpredictable nation with a thermonuclear device sends a cold war shiver down my spine. As the U.S. joined other nuclear armed nations in condemning this recent action calling the test “totally unacceptable,” I couldn’t help but be reminded of those good old cold war days when we proudly broadcast our own thermonuclear tests, available for viewing coast to coast. Nuclear jitters would chase me throughout my childhood. 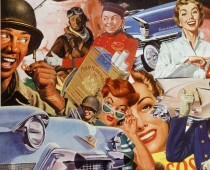 1954 stared off with a real blast. By March of that year America had exploded our second hydrogen bomb and the next month we watched the broadcast of the first explosion from 2 years earlier. In April 1954 “Operation Ivy,” a once top-secret film that had been shot in The Marshall Islands in 1952, offered viewers ring side seats of the first full-scale test of a thermal nuclear device, all in the comfort of their own living rooms! The recently developed Super-Bomb was thousands more powerful than the atom bomb dropped on Hiroshima, making it seem as innocent as its Mother Goose sounding nick name of Little Boy. On the morning of April first, my bleary-eyed mother got a real jolt with her morning coffee as she was treated to a bird’s-eye view of a nuclear explosion right there on the family Philco. How about a rasher of radioactive bacon to go with those sunny-side up eggs? Walter Cronkite, congenial host of The CBS Morning Show jumped the gun on the competition, teasing the early riser with sampling of clips from the “Operation Ivy” film scheduled to be broadcast on all 3 channels later in the day. The press was allowed an exclusive preview of the film along with Congress, but placed under an “embargo” halting any published reviews until the film was released to the general public a week later. Nuclear family watch the nuclear blast on their TV that promised an image so life-like its almost like being their! That evening, as TV sets warmed up all across the nation, an ominous soundtrack of music could be heard emanating from their sets. As the music built to a crescendo , my parents along with millions of other captivated TV viewers heard a metronomic voice counting down – 5 – 4 – 3 – 2 – 1 and then got an eyeful when an awesome blast filled their TV screen with a gigantic billowing fireball. The film showed the sensational atomic fireball rising out of the sea, the shock waves rushing across the ocean surface searing away sands and coral beneath it, as an enormous mushroom cloud darkens the sky. Just to make sure the viewer understood the magnitude of the power wielded by this nuclear device they superimposed the explosion on the skyline of Manhattan, transmuting the devastation of the Marshal Islands into visions of American cities in smoldering ruins. Three weeks later Life magazine brought us pictures of the explosion in living color. As a patriotic gesture to the American public, Life presented scenes from the Ivy Color film “ in the spirit of President Eisenhower’s address” the previous week on the subject of the fears raised by threatening aspects of the world today including the hydrogen bomb. “The greater any of these apprehensions, the greater is the need that we look at then clearly face to face without fear, like honest straightforward Americans…”the President reassured a jittery nation. Man’s harnessing of nature for our purposes has been man’s great triumph! The march of progress continues. Thank you Sally… growing up in this era was terrifying for me as well. Laying awake at night wondering which of my friends with bomb shelters would let me in. Hoping the president and the premiere of Russia would use the red phone before pushing the button. I recall one day, as I was watching a horror movie on television (one of my mental nuclear deterrents), being asked “Aren’t you going to have nightmares from watching those movies?” My thought at the time was “Everyone knows monsters aren’t real.” The real monsters in my childhood were all human. Agree. My nightmares were manufactured more by the arms race than anything Hollywood could conjure up! Great post. 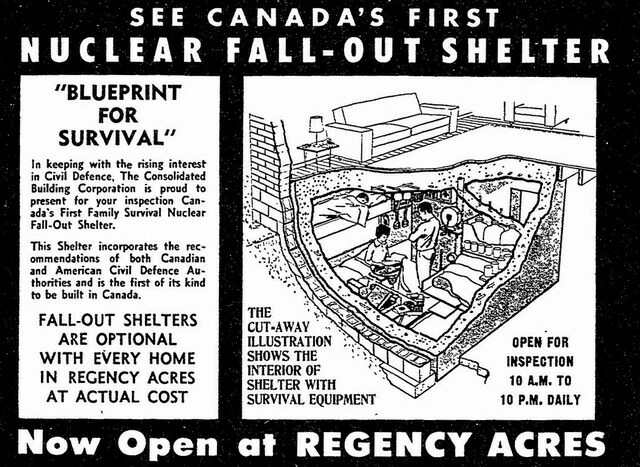 I remember reading a pamphlet in the 50s telling you how to build a bomb shelter in your home. I wish I had kept it.